Have a Golf Outing coming up? and wondering where the sponsors are going to come from? 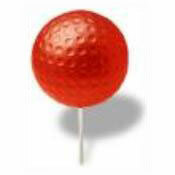 Put "YOUR SPONSORS NAME HERE" on attractive customized tee markers and golf flags. Use this proven fundraising technique, they will remember you for many years to come, and will want to sign-up again next year. Extra Decal for Rectangle Markers 5"x10"